List of Amazon Links Worldwide to get the Book Tailbone Pain Relief Now! The book is filled with useful information about coccyx pain (tailbone pain), including causes, tests, and treatments. You can use the Amazon website specific to your part of the world. Learn about Tailbone Pain Awareness Day, which is Thursday, November 15, 2015. 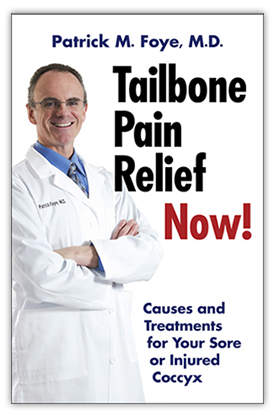 For a very limited time, you can get a free copy of Dr. Foye’s book, Tailbone Pain Relief Now! 3 Years since Publishing the Book: Tailbone Pain Relief Now! Patrick Foye, MD, Reviews a New Book for Doctors, about Coccyx Pain, Tailbone Pain, Coccydynia. This book is written by the physicians and speakers from the First International Coccyx Pain Symposium, which was held in Paris, France, in 2016. Dr. Foye wrote a chapter on using injections to treat tailbone pain.